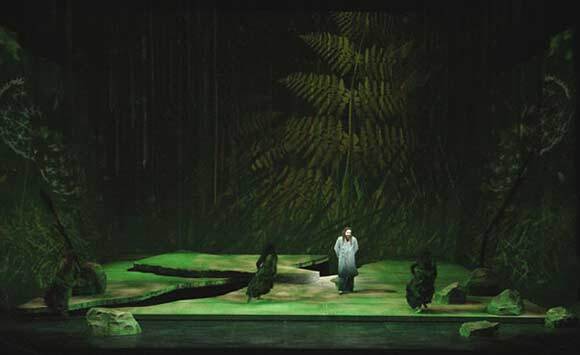 The Royal Opera House’s article says “Rusalka is an opera about singing. Or rather, what happens when you cannot sing”. It echoes the story of The Little Mermaid. I loved Disney’s ‘Ariel (The Little Mermaid)’ as a child. I enjoy singing the aria ‘Song to the Moon’ even more. 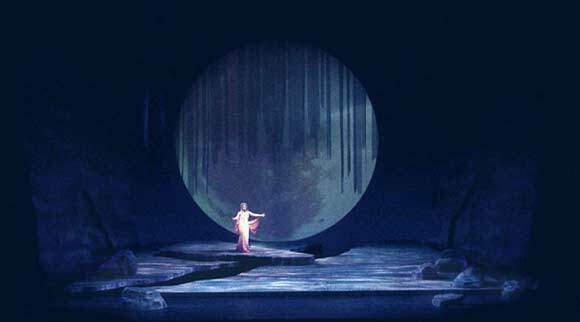 This aria comes at the start of the story as Rusalka, a water nymph, sings to the moon. It is a plea to the moon to reveal her love to the Prince. 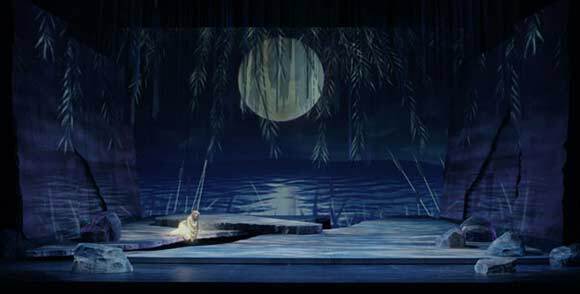 Rusalka gives up her voice to be united with the Prince, but he is put off because she cannot say a word and he accepts the hand of a Foreign Princess. The witch Jezibaba’s curse is for Rusalka to live in the depths of the lake forever. I sing this aria in Czech which makes it even more beautiful as I have to demonstrate the intense feeling to my English speaking audiences. 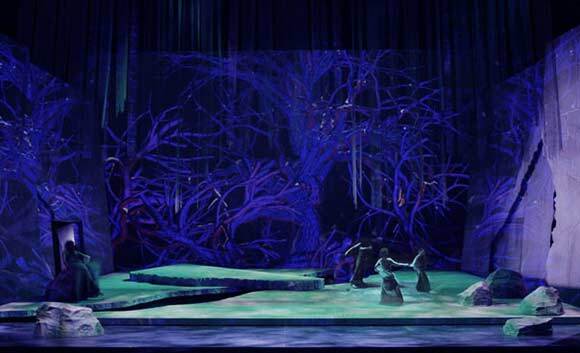 Classical Music says “Rusalka is the most popular Czech opera in circulation. Classic fm writes “The song is based on the folk tale of Undine, and when he wrote Rusalka Hans Christian Andersen’s The Little Mermaid was already 65 years old”. I was asked to perform ‘Rusalka’ at the Bowdon Festival in Altrincham at the end of the month, 30th November, so I dusted the score down and lovingly refreshed my knowledge of it. Realising I’d not fully researched it before I thought I’d share my background discovery with you. 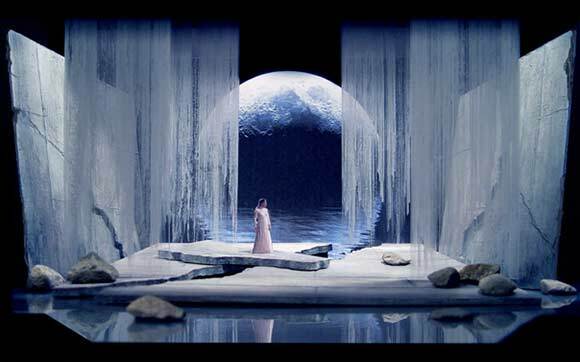 Whilst doing my research I came across these great images from the set designer Erhard Rom from the Minnesota Opera Production and I hope that they give you a flavour of the opera and it’s story. It is in my program this Saturday in Derby and I will be singing it on the 30th November with the Milnrow Brass Band. My favourite group of men The Tideswell Male Voice Choir join me in Bowdon in a Christmas Spectacular. I only know two songs in Czech Rusalka and the new one I learnt in September called ‘Songs My Mother Taught Me’ for the Kathleen Ferrier competition both by Dvorak beautiful songs both of them. I’d love to sing it with a harp and full orchestra wouldn’t that be wonderful. Hello John, Anna Netrebko is another fabulous singer. I’m looking forward to performing the song at the Autumn Leaves event and at the Bowdon Festival at the end of November. The Moon is an old friend …. You are truly amazing Charlotte! Thank you for sharing your research with us. It is always interesting to learn the stories behind a given piece of music. May God bless you as you perform! Thank you for your lovely message I appreciate it. Charlotte, best of luck to you in your upcoming performances. It is fun for me to watch your singing career unfold. I imagine you will do a splendid job in this aria, having listened to your voice in other recordings on here. I do hope you get the opportunity to record this lovely piece of music and share it with us here. I wrote about this aria several years ago in my own blog. My favorite rendition of all time is by Frederica Von Stade, who just seems to carry that longing in her voice that compliments the emotion of the aria. But let’s not debate, instead celebrate all the greats who have sung this, past, present, and with you future! Good luck once again in the upcoming months. Thank you Renee, thanks for dropping by 🙂 I do hope that you can call back again soon. Nothing quite as romantic and mysterious as the moon with its lovers. Great story and the photos of the sets look amazing… Wonderful video and voice, mesmerizing. What beautiful images! I love hearing so much about this song- -you really do your research. Can’t wait to hear you sing it! I remember my singing teacher suggesting I keep notes on each song on an index card in a box. I will try to set up a computer database with them in so that I can put my favourite You Tube clips in with the notes and pictures, I am a much better visual learner than just reading reams of text. I’ll see what I can do about recording it or get my Dad to at the concert :). Hello Charlotte, What a beautiful post! Rusalka is very special to me. Thank you very much for the images in your post and the video of Renee Fleming performing this exquisite aria. Looking forward to hearing your rendition! This is one of the songs that make me wish I was a soprano and able to sing this. xD But alas, I am not. Hi Cecilia, thanks for keeping in touch, is your concert at Pitea due this week? if so good luck with it. Moon over the Lost City sounds like a good idea, hope you get some inspiration from the set designs and the music. One of my all time favourite arias. It really set alight my imagination as a child listening to it. Thank you for sharing your research. It has really brightened my day. 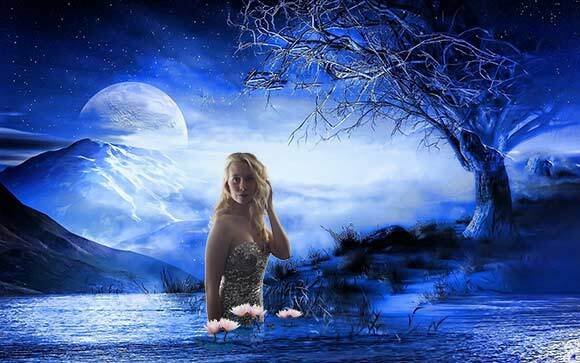 Hi Katherine, it is lovely to think that I helped brighten your day 🙂 The song is beautiful both to perform and to listen to. I am so pleased that you enjoyed the rendition by Renee Fleming 🙂 I would love to think that one day my performance of this song will evoke similar emotions to those that you have so beautifully expressed. I would love to just stand on a set like this and take it all in, then to sing in such a space would be fabulous. Hi Arti, yes the sets are very modern, contemporary. This really is one of my favourite songs. I must download more Dvorak into my iPhone. How beautiful Charlotte! You are an inspiration; doing what you love. Your pic could grace the cover of a romance novel! Have a fantastic day! Hi Koko, its lovely to hear from you again I know you’ve been really very busy so I appreciate you dropping in 😉 . If you ever get around to writing that novel Koko you can have the cover with pleasure. I have written such a novel! We’ve been battling illness here for all of October and now creeping into November! I miss blogging but happy at least I can read your stories! I love this song! I can’t wait to hear your recording of it, Charlotte. As I’ve mentioned, I usually sing more light opera than regular opera, but your post reminded me that this is one of the “grand opera” arias I need to tell my teacher that I want to add to my repertoire!–besides Juliette’s Waltz Song “Je Veux Vivre” from Gounod’s “Romeo et Juliette.” Have you ever performed that one? Have a wonderful day, and keep singing! 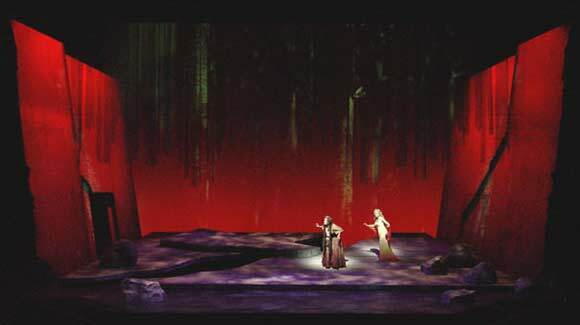 I have only come to Rusalka in the last few years. This aria is a dream, but the opera is tricky to direct successfully. We saw the wonderful Glyndebourne production live (and on TV as well) and then the following year at the ROH (not so good). I look forward to hearing you do this sometime, though Renée Fleming will be a hard act to follow! At my age Renee Fleming is an impossible act to follow 😉 I hope I haven’t raised expectations for tomorrow lol 😉 The Opera Department at my Conservatoire have the opera ‘The Return of Ulysses’ by Monteverdi on in the Opera Studio this week it was sold out. I was supposed to go to watch on Tuesday but assisted back stage with the Surtitles instead when my friend fell poorly. Rusalka has such a brilliant song at the start but then loses her voice, did the performer playing Rusalka dance in the staging you saw? I’ll be giving the song an outing tomorrow in Derbyshire with a piano backing track just to add a bit more challenge to an already challenging piece 😉 you’re welcome. Much success. And the sets, wow. And you look awesome. My Dad did the picture, he helped my big brother Matt learn how to use Photoshop for a school enterprise project about seven years ago then learnt some new tricks off my younger brother when he did Graphics at GCSE I love what he does with my posters. Thanks Alex, The scenery shots are fabulous. One of my friends is a set designer I must make sure he’s seen these for inspiration. 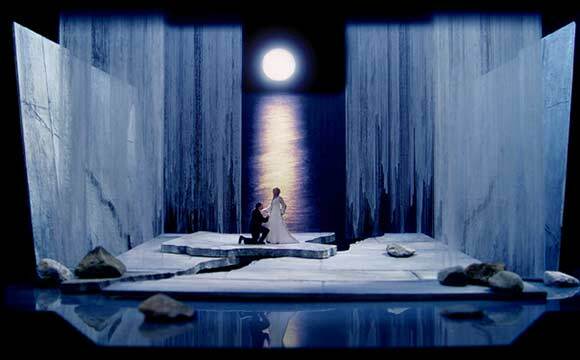 What a beautiful, inspired concept for the sets of Rusalka. “Song to the Moon” is one of my favorite arias. I saw the opera years ago at the Metropolitan. The music is glorious. 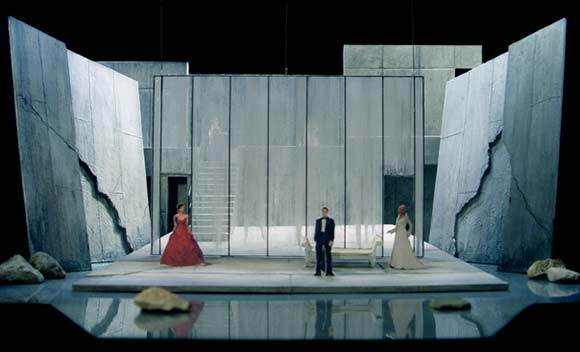 I’ve never forgotten the sets in the performance at the Met, which were verdant and lush and lit by moonlight. A wonderful story, so open to interpretation from every able. Looking forward to hearing your recording! Thanks for reviving a cherished memory! So lovely. Thank you for uploading your interpretation of this beautiful aria. I am especially struck by your take on the final line. You seem to have mixed wistful yearning with defiance, as if willing the moon to not disappear. Loved that. Hello 🙂 as someone mention before, I ve heard Song to the moon from Anna Netrebko and I was simply charmed by Rusalka… How can she offer such sacrifice for such unstable love… Is the forgiveness deserved in the end? I am really happy about you ll sing that too:). Czech is a difficult language I know that as native speaker. I cant even wait to listen to Your record. Oh, I am sorry if I am late, but * happy birthday to you * 🙂 ! Well, I also wouldnt give up my voice. Yes sure. Post a copy, As I hear it, I ll add opinion. Very old Rusalka record from Mrs. Beňačková, if it is allowed to post ytb links:). Hi Lukáš, I’ll send you a link 😉 when I get chance to record it. Those set designs are amazing! It must be brilliant to step out on such a stage. Thank you for taking the time to visit. type two words. Rusalka Subrtova and then listen. worked on it. Since there my passion for Rusalka. I see what you mean Jan, there is definitely more intensity behind each singular word, which can be more important than just a beautiful tone. A great example of what I’ve been working on recently. Did you listen to my version with the Milnrow Brass Band, it was our first run through so could have been more rehearsed but I’d appreciate your feedback, there is a link now at the bottom of the post. Hi Jan Fleming and Netrebko are just such fabulous singers I’m pleased to even have my name mentioned in the same paragraph ;). Thanks for your kind words, did you see my other Czech piece Songs My Mother Taught Me? This is a newer piece for me and I’m still working on it. I have found out you are going to sing Rusalka again so I wish you good luck. That is absolutely beautiful, wish I could hear you sing it. the scenery is gorgeous. This was my first experience hearing Czech sung. (I have heard it spoken but never sung.) Your voice is so lovely in any language. This is such a lovely song. I’ve heard a lot of Dvorak before but never this one. You continue to inspire and delight me. Thank you for sharing. May you have a long and illustrious career. Thank you very much for your lovely message. Charlotte, do you know where we can get the music score in Italian? I will be singing song to the moon at my next competition and I love the Italian rendition. I don’t have it in Italian Mia I can recommend Forsyths in Manchester (they’re online) for scores 😊. If I get the opportunity I’ll look at the library.